The Port Authority has served New York - New Jersey metropolitan region since 1921. The agency is proud of its accomplishments in developing, operating and maintaining transportation and trade facilities critical to the economic well being of the bi-state area. The Port Authority also takes great pride in a long history of providing high quality customer service. Our commitment is reflected in courteous and dedicated employees, cost-effective operations and new, improved and efficient facilities and systems. The reason for the Port Authority's creation can be traced back more than 300 years. Initially, there was the accident of political history that divided a common port area between what was ultimately became the states of New York and New Jersey. Secondly, and far less accidentally, were the disputes that developed between the two states. New York and New Jersey quarreled throughout the 19th Century over their common harbor and waterways. A dispute over the boundary line through the harbor and the Hudson, finally settled by the Treaty of 1834, once lead state police to exchange shots in the middle of the river. The coming of the railroads was a source of bitter litigation between the two states. New Jersey interests saw an advantage in charging one set of rail freight rates to the New Jersey railheads and another, higher set, to New York side. The area around the port was finally agreed to be, in effect, one community, and the conflict between New York and New Jersey was seen as wasting the port's potential. The states sought a governmental body to administer port affairs and found a model in the Port of London, administered by what was then the only public authority in the world. On April 30th, 1921, as the first of it's kind in the Western Hemisphere. The Port of New York was established to administer the common harbor interests of New York and New Jersey. We were the first interstate agency ever created under a clause of the Constitution permitting compacts between states, with congressional consent. Our area of jurisdiction was called the "Port District", a bi-state region of about 1,500 square miles centered on the Statue of Liberty. Our name was changed to The Port of New York and New Jersey in 1972 to identify more accurately our status as a bi-state agency. In 1928, the Port Authority realized the need for efficient police patrol and protection at their growing facilities. On June 1st, 1928, forty men were selected to police the Goethals and Outerbridge Crossing Bridges. These original forty officers were known as "Bridgemen". Given only start-up funds for administration, the Port Authority struggled through the first few years. Then in 1930, the states gave the agency control of the newly opened Holland Tunnel as a financial cornerstone. The 199 traffic officers employed by the Tunnel Commission were merged with the original Bridgemen into one unified Port Authority Police Force. The Port Authority began blazing new paths in transportation, engineering, law and administration. In 1931, the George Washington Bridge and Bayonne Bridges opened, and in 1937, the Lincoln Tunnel began operating. In the late 1940's, at the cities' request, the Port Authority leased three airports from Newark and New York and made ready doe the jet age. LaGuardia and Newark Airports, along with an infant airport on a large meadow destined to become John F. Kennedy International, were linked into a regional aviation system. Port Authority Police responsibilities grew, the airport assigned police officers were trained as aircraft crash/fire/rescue responders. In the 1950's and 60's the Port Authority Bus Terminal was built and the second deck on the George Washington Bridge was added. The Lincoln Tunnel's third tube was completed. During this era, many Brooklyn Piers were built and the world's first container ports at Port Newark and Port Elizabeth were developed. 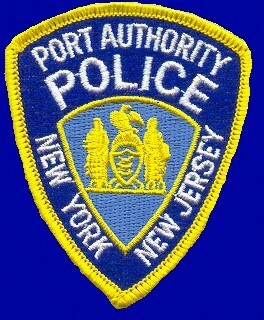 In 1952, the Port Authority Police Cadet program was implemented. These Cadets attended college full time while collecting tolls for thirty-two hours a week. Upon earning their AA degree, they entered the Police Academy. The Cadet Program ended in 1962. Also, in 1962 the Port Authority assumed operation of the Hudson and Manhattan Railroad renaming it PATH (Port Authority Trans-Hudson. The H. and M. police force was absorbed into the Port Authority Police Force. In 1973, President Richard Nixon signed the Federal Aviation Regulation FAR 107, aimed at curbing terrorism. This mandated that all passengers be screened for weapons at United States airport. Hundreds of officers were deployed to this new area of police responsibilities. In the 1970's and 1980's, the Port Authority helped advance the region's interests through port and trade promotion and construction of the towering World Trade Center. In 1987, the agency also launched a massive multi-billion dollar capital improvement program, in 1977, the first five women police officers were welcomed aboard. In the 1990's, the Port Authority placed renewed emphasis on customer service. Among key service improvements was the EZ-Pass. Electronic toll collection was introduced at the Agency's tunnels and bridges, Newark Airport's passenger monorail was completed, and the first new passenger terminal in 25 years opened at JFK airport. The agency also went on-line with a Home Page on the Worldwide Web in 1996. Today, the Port Authority Police Force numbers over 1,200 and our responsibilities include not only law enforcement and the protection for the safety and security of all the Port Authority land, sea, air, and rail facilities in the Port District. The Department's headquarters is located in Jersey City, New Jersey, where managerial and command functions reside. The nerve center of the force is the Central Police Desk, which is also located in Jersey City, is staffed around-the-clock and is the hub of the Departments communications network. There, personnel are assigned to needed areas, all radio transmissions are monitored, and the computer terminals are integrated into the NY & NJ Intelligence and Crime Information System as well as the National Crime Information Center (NCIC) in Washington, D.C. Information received from these sources is supplied to the officers in the field when needed. The Port Authority's three major airports, Newark International, John F. Kennedy International, and LaGuardia demand a large variety police duties. Police personnel cover screening points, respond to all aircraft incidents and aid travelers from all parts of the world. A number of officers have received defibrillation training. The ability to provide therapy for a person in cardiac arrest who is lifeless by using an electric shock to jolt the heart into a life-sustaining rhythm delivers a very special customer service. Escorting and protecting visiting dignitaries is provided for on a daily basis. The president of the United States, Pope John Paul II, and various other dignitaries and foreign Heads of State attending United Nations have all traveled through Port Authority facilities. Due to the wide array of foreign dignitaries traveling through aport Authority airports, establishing good working relationships is necessary with Federal, State, and local law enforcement agencies. The Port Authority Police provides constant communications and intense coordination with the United States Secret Service, the FBI, the United States State Department, Customs Department. Immigration Department, and State and Local Police Departments. The Port Authority Police are also responsible for the fire-fighting and crash emergency rescue at the three airports, and for all other aircraft emergency incidents. Police personnel assigned to fire and rescue duty are highly trained in all phases of these functions including the operation of sophisticated and complex equipment. a state of the art aircraft rescue and fire fighter fuel spill trainer facility is located at JFK International Airport. This computerized facility utilizes propane to stimulate aircraft crash conditions. Port Authority Marine terminal facilities handle thousands of ships and millions of tons of cargo per year. Police operations at Port Newark/Elizabeth and the Brooklyn Piers include everything from traffic control to the prevention and investigation of cargo thefts. At Washington Bridges, and the Outerbridge Crossing, the Port Authority Police Officer's duties are patrol, traffic control, hazardous cargo inspections, truck weigh and emergency services, as well as enforcement for violations of motor violations motor vehicle laws. Police at these crossings have also instituted programs that maintain a constant campaign against drunk driving. The Port Authority Police Commercial Vehicle Enforcement Unit is a highly mobile protective team designated to ensuring the safety of all motorists as they traverse these interstate crossings. Commercial vehicles, by the nature of their size and weight, damage roads at a higher rate, as well as cause a higher risk of their size and injury and facility when involved in an accident. To this end, the members of the team have been trained by numerous agencies in weight enforcement, Hazardous Materials, and the Code of Federal Regulations. Well over 1/3 of all vehicles stopped are placed out of service for safety violations. A reduction in accidents as well as improved safety are some of the benefits gained from this unit. The Port Authority operates the largest and busiest Bus Terminal in the nation, accommodating millions of bus passengers. Police assignments demand a broad range of functions, from locating lost children to aiding everyday commuters. They are responsible for the general security of the facility utilizing a variety of patrol tactics, Police Officer/Social Worker teams patrol the Bus Terminal and identify youngsters that may be runaways, throwaways, or missing persons. They provide crisis intervention counseling, placement with social services agencies, and reunions with families when appropriate. The Criminal Investigations Bureau consists of Detectives and Supervisors that are specifically trained for crimes occurring at transportation facilities. These Criminal Investigation Bureau has worked on computerized airline ticket fraud, property and drug interdictions. They have seized millions of dollars of goods and narcotics. Additionally, the Criminal Investigations Bureau has worked jointly with local, state and federal agencies in the fight against crime. Some of these agencies include the New Jersey State Police, The New York City Police Department, United States Customs, United States Drug Enforcement Agency and Waterfront Commission. Members of the Criminal Investigations Bureau also work as part of the FBI Joint Terrorist Task Force to prevent terrorist activities in the region. The PATH facility is one of the most intensively policed rail rapid transit systems in the world. Millions of passengers use the PATH system. The system's stations are monitored by closed circuit television to aid police personnel in their patrol. Police Officers assigned to PATH also take part in specialized training ranging from accident investigation to emergency rescue techniques. These Police Officers are trained to respond to Hazardous materials spills, railroad car accidents, fires and other natural or man made incidents. To further enhance our crime fighting capabilities, the Port Authority Police recently expanded its K-9 program. Narcotics detection teams consisting of specially trained Officers and their canine partners patrol suspected areas to reduce narcotics trafficking. To combat the potential treat of terrorism, additional K-9 teams have been developed that specialize in the detection of explosives. These teams are patrolling Port Authority facilities to provide and even further level of protection to the traveling public. The Port Authority's World Trade Center complex receives 50,000 employees and 70,000 visitors per day. For the Port Authority Police Officer, this was a demanding assignment. The complex contains two 110 story buildings, and an array of buildings which contain foreign banks, consultants, restaurants, as well as business firms from all over the world. By utilizing specialized techniques and crime prevention programs, police officers and detectives assigned to the facility have minimized criminal activity. Port Authority Police Academy recruits receive over 20 weeks of intensive training in New York and New Jersey law, behavioral sciences, public relations, police practices and procedures, laws of arrest, court procedures and testimony. They are also trained in rules of evidence, defensive tactics, first aid, fire fighting, police patrol and traffic duty, fire arms training, defensive and pursuit driving, water safety and rescue. The new officers go through an in-residency program, staying overnight in barracks during the week, building camaraderie and Espirt De Corps. Throughout their careers, Port Authority Police Officers return to the Academy both for refresher courses and for training in new techniques added to the curriculum. The Koebel Memorial Police Firearms Training Center is dedicated to the memory of Police Officer Henry J. Koebel, who was killed in the line of duty in May of 1978. There, Police Academy staff operates eighteen shooting ports within this state-of-the-art, computerized firearms training facility. Features include moveable target lights and noise controls/don't shoot situations, as well as standard marksmanship instructions. The Port Authority Police Force has evolved through a history of many challenges. The have developed into a force of professional and dedicated men and women always ready to serve and protect the people who work at and travel through Port Authority facilities. The Port Authority Police Department is proud of the excellent services it provides the traveling public. With a consistent dedication to quality training and equipment, we the Port Authority Police act with Pride, Service and Distinction setting a standard unique in the law enforcement community. The above article was put together by Mike Ferranola, Ret. PAPD and currently Sgt-At-Arms for the (RPA), Retired Police Association of the State of New York prior to the cowardly attack September 11th, 2001 on the World Trade Center in New York City. The World Trade Center complex will be rebuilt to stand as a memorial for all those that perished on that horrific day and as a beacon of hope for all the people of the free world.